The BigShot ABY makes it easy to switch between two amps and with the built-in isolation transformer, hum and buzz caused by ground loops can be eliminated. A separate tuner out keeps this tone altering device out of the main signal path. You can use the BigShot ABY as a simple mute footswitch for quiet on-stage tuning. Simply depress the AB selector switch and the signal going to the amp is turned off. This keeps the signal going to the tuner output always on, allowing you to tune without bothering others. 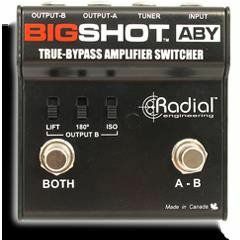 The BigShot ABY can also be used to switch channels on older vintage amps that do not have remote switching. Simply send the OUT-A and OUT-B to the two channels on your amp and select channels as needed.